One of my ex-students had recently returned from his hometown in Zhejiang (China) & brought me the famous Jin Hua Ham. The dry-cured ham is highly regarded in the Chinese cuisine & is usually used in stock, imparting its distinctive & umami flavour to any dish. 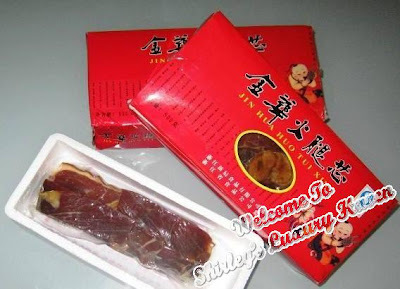 Jin Hua Ham is also an important ingredient in the “Buddha jumps over the wall” dish. I was overjoyed when Li Jie delivered 2 boxes of the precious ham. I knew for that instant what I would use them for. The Tien Jin Cabbage is often paired with Jin Hua Ham, commonly found in Chinese restaurants. It’s also one of my fave dishes & it’s a pleasure to share with you this recipe. Recipe Featured @ PtitChef as 'Starter of the Day! Cut off end of cabbage stalk & rinse. Cut into 6 equal parts. Shred & then blanch ham. Set aside. Heat broth in a small saucepan & add ham & ginger. Simmer for about 10 mins. Blanch vegetables & transfer onto serving plate. When broth is ready, add creamer, seasonings, cornstarch & mix well. 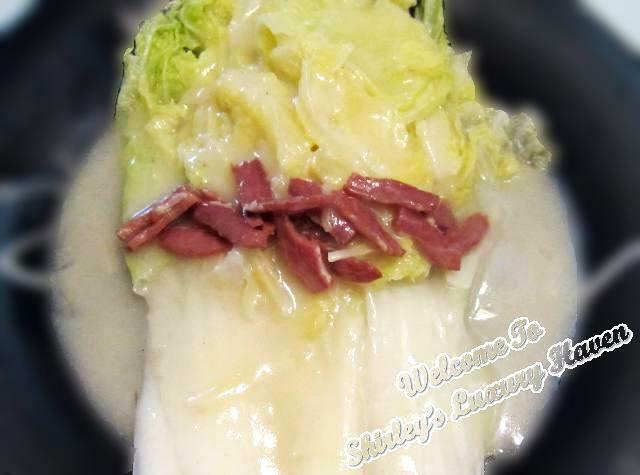 Pour the sauce over the cabbage & you’ll get a tasty creamy vegetable dish! Looks lovely Shirley although I have not the ingredients from China. This looks amazing, Shirley! This is such a tasty and comforting dish... Hmm... I should go look for Jin Hua Ham at Chinatown... I hope they sell these over here. Nava, I'm sure u can get in from Chinatown. Wi, I'm sure they sell it there. It's really easy to cook this. So easy and quick to make, yet looks so appetizing! Umami is the perfect term for this dish. Lovely presentation, too! Ham soup and creamed cabbage are part of my heritage, too -- from Czechoslovakia originally -- "good food" connects the world! Neha, glad u like it too! Peggy, hope u'll try this recipe in your next Chinese cooking session. How lucky are you to receive such a gift. I'm not a big pork fan, but I do know how highly regarded this ham is in Chinese cooking. I love the simplicity of your dish. Just shows what kind of flavours this ham can bring to a dish. Lovely recipe, Shirley. Lequan, I'm a lucky gal :) Heehee! U can use this in soup instead if u don't like to eat pork. It gives the stock a very rich taste & smell. 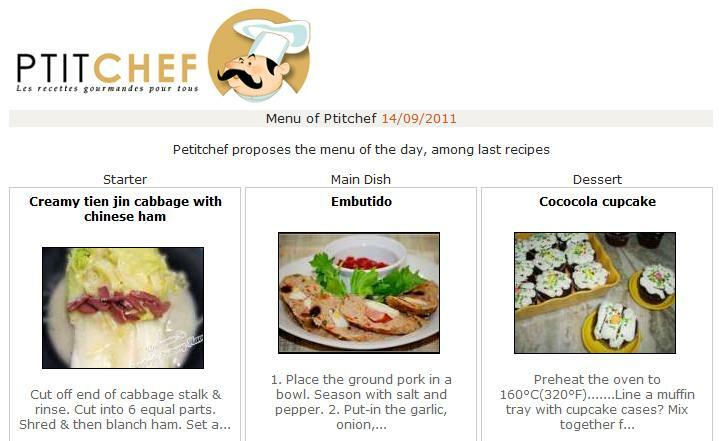 I was so excited when I opened my emails today and saw your recipe on the front page of Petite Chef! Congratulations Shirley!! 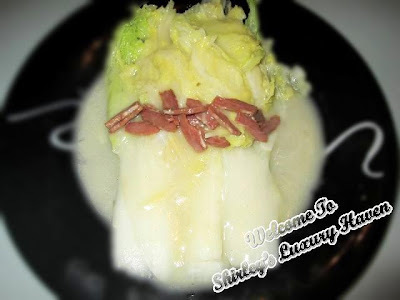 This is a beautiful recipe and I know with the addition of the Chinese Ham it taste fantastic! I also wanted to let you know that I've really been enjoying all of your beautiful bento box creations! You're such an inspiring chef!! 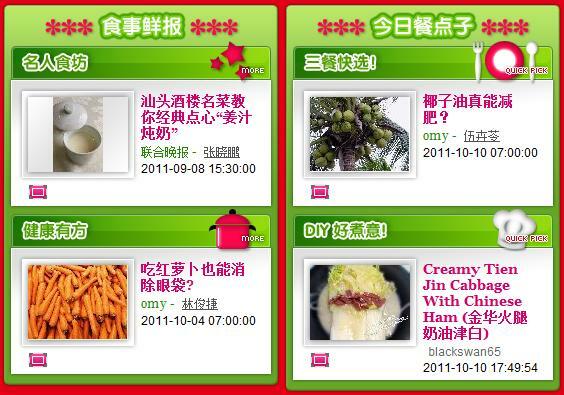 Hi your recipe is awesome and I would like to try... May I know where can I buy jinhua ham in Singapore? Anonymous, this dish is perfect for CNY! You should be able to get it from Chinatown; those shops selling wax duck, Chinese sausages etc. Have fun! Hello, what is creamer? Is that the powder form creamer which is used for coffee and tea? Can I use cows milk or soy milk instead? I bought my jin hua ham from sheng shiong.